Happy Monday!! Hope you had a wonderful weekend and whether you went out to view the eclipse or not.. I am not judging! I for one did not because partly I am a chicken and am scared of going blind and partly I am not really into that kind of stuff. But if you did have an eclipse viewing party, I hope you had a blast and wore your glasses! 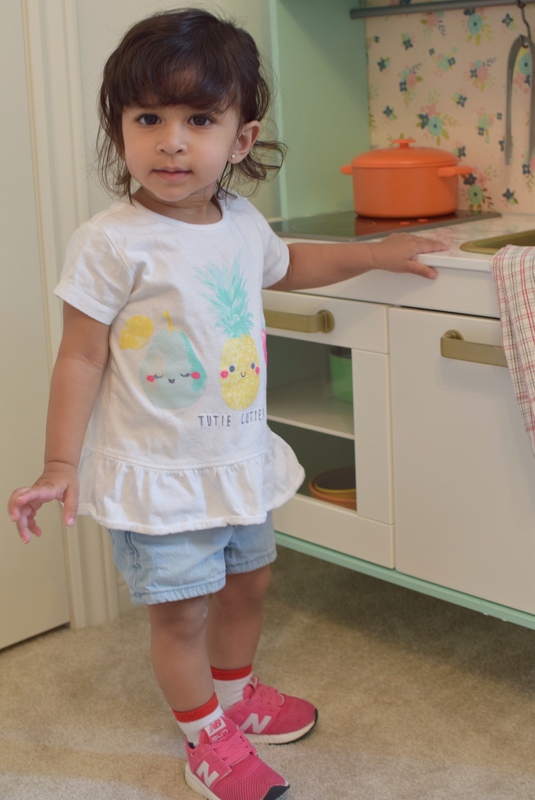 Today I am sharing a fun DIY we did for our daughter! 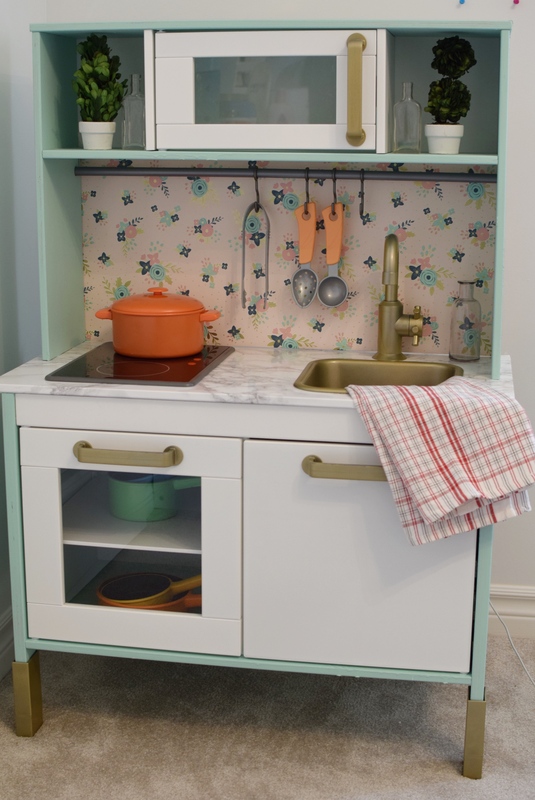 It was inspired by the lovely Chanelle of My Life on Hibiscus Way – she remodelled an Ikea DUKTIG play kitchen for her daughter and I was immediately in love! I literally went out the next day and purchased one! So.. given that I love all things white – the main body of the kitchen was painted a mint! I used Behr Free Spirit to paint the sides of the kitchen that are in the natural oak finish. Next, I spray painted all the handles, the feet, sink and faucet a gold – I used Rustoleum’s Gold Spray Paint. Up next – marble counter tops! hehehe… more like faux marble counter tops! We ordered a marble contact paper from amazon and used it to cover the natural oak counter top. For the above steps, I really didn’t think ahead to take photos! Silly me – but it is pretty straight forward, to be honest. Once all the above steps are completed, you can simply assemble the DUKTIG kitchen according to the handy instructions provided by Ikea. and I wanted something similar. Luckily, I came across this beautiful wrapping paper at Home Sense and it was just perfect! It had the same mint colour and pulled in the gold and the shades of peachy/pink that are in her room! I cut a bristol board (from the dollar store or your craft store) to size and glued on the wrapping paper as if I was wrapping a present, to tuck around the edges. 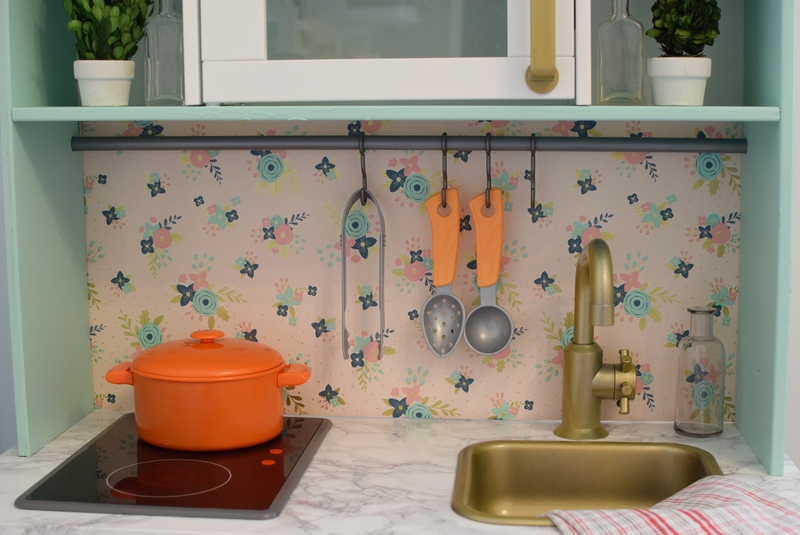 Then we simply glued the faux backsplash to the ikea kitchen and called it a win! 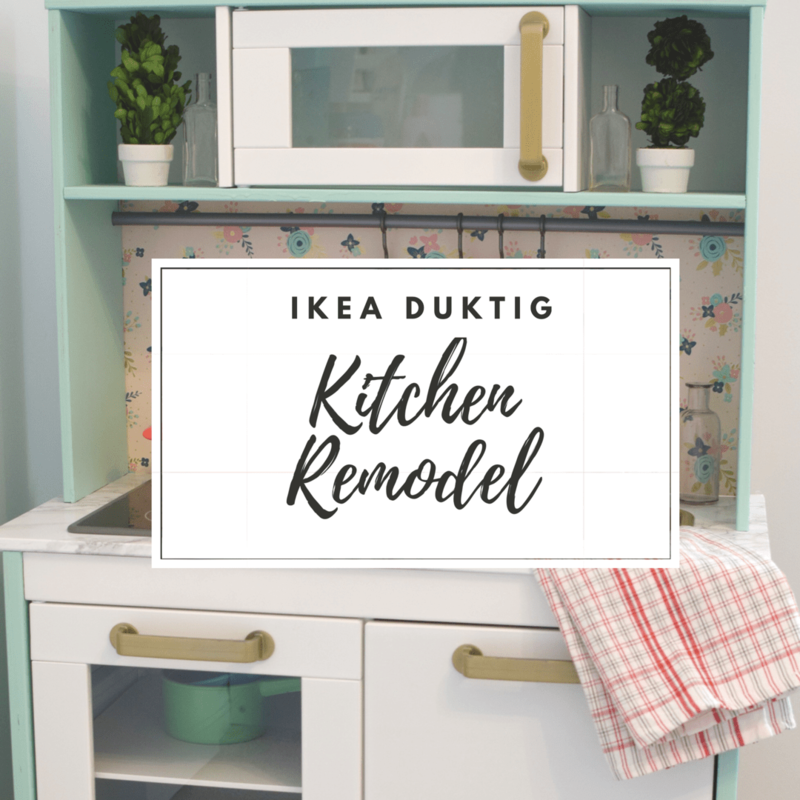 Hope you enjoyed this easy tutorial on how to remodel a basic DUKTIG kitchen into something cute for your little ones!